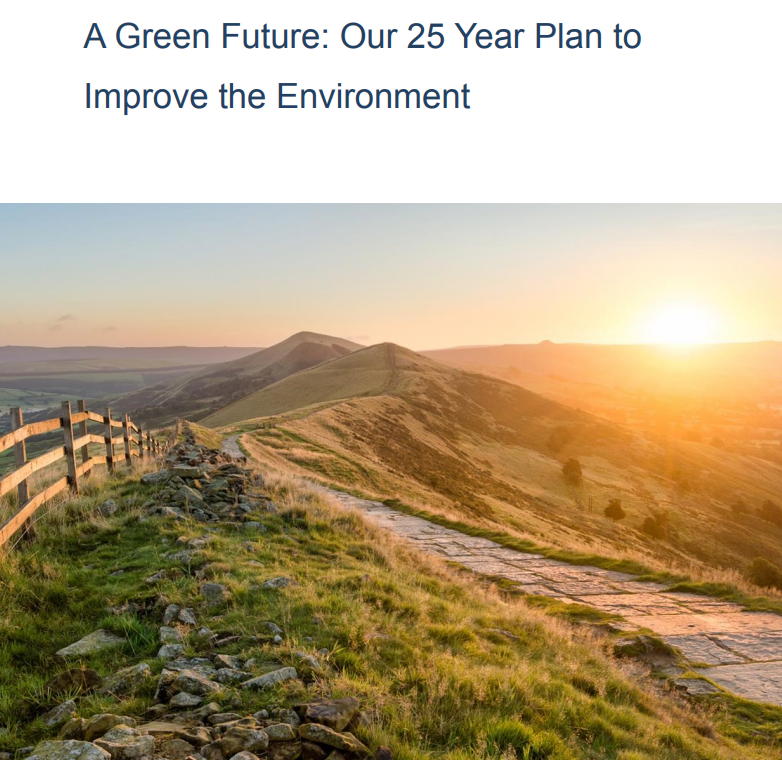 Theresa and Michael have set out their plan for a green future in a new 151-page document. It’s described as a 25-year plan, which seems a bit optimistic in view of the likely lifetime of the current Government. No, I haven’t read it, but it has a nice picture of the Peak District on the cover and there’s also a picture of a cute red squirrel. 2. Clean and plentiful water. 3. Thriving plants and wildlife. 4. A reduced risk of harm from environmental hazards such as flooding and drought. 5. Using resources from nature more sustainably and efficiently. 6. Enhanced beauty, heritage and engagement with the natural environment. 7. Mitigating and adapting to climate change. 9. Managing exposure to chemicals. There are six main chapters, and again, none of these focuses specifically on climate or has climate in the title. Although the C-word comes up regularly in the document, it is mostly as virtue-signalling. There appears to be no new specific policy or commitment – just a reiteration of support for the Paris agreement and the 2008 Climate Change Act. I don’t think the climateers are going to like it. Tags: Gove, May, politics. Bookmark the permalink. Previous post ← Global Cooling Not Worth Shivering About But Is A Broken Ice Age Cycle Worth Sweating About? Perhaps the so-called “climate concerned” have become tedious even to the politicians? Afterall, how much doom and gloom (that never actually quite happens) can even a cynical poli take? In between chores this morning in the car I caught Stanley Johnson, father of Boris and a veteran green campaigner, being interviewed and responding to listeners on this new initiative on Radio 5 Live. He spoke highly and warmly of Gove and suggested that many of May’s words, spoken and written, were being penned by Michael. The presenter ribbed him a few times about the famous stabbing of his son’s ambitions to be Prime Minister in June 2016 by the now Environment Secretary. “We Johnsons know how the bury the hatchet, not between the shoulder blades but firmly in the ground.” It was highly entertaining stuff, whatever one felt about the content of the new green conservatism. Richard, I’m hoping that our 14 Billion readers (borrowing a phrase from Dan Kahan) will read the report and summarise the key points in comments, so that I don’t have to. Mam Tor – I know it well, but it didn’t used to be paved with good old gritstone roofing stones. I wonder who (or how many people) actually wrote this 151 page document. Gove obviously doesn’t have the time. Whoever it is still uses the fake words “carbon emissions” on several occasions. Well, the Woodland Trust like it, which is not surprising, since it contains more about woodlands and forests than it does about climate change. In particular, there’s quite a bot about the “Northern Forest” plan. CPRE are delighted, but say the Government needs to follow up its vision with actions. Total projected cost 500 million, government putting in 5.5 million starter money. How many trees have had to be felled to produce this 151 page document? So is the new Northern Forest an act of remorse for not minimising this waste. All this to get Lucas to vote with the Tories, or is it merely make work to keep Govey busy and diverted from exercising with his little knives? As far as green-leaning callers to Radio 5 Live this morning were concerned, it was fracking that was the make-or-break issue which meant they doubted the Tories would become truly credible to them. Father Johnson made soothing noises about Gove ensuring nasty frackers wouldn’t be allowed in places of beauty – conveniently not mentioning eyesore wind farms at this point, unlike Phillip Bratby! I think I agree that fracking is the key dividing line for the Tory administration as a whole, energy having been separated from climate change. Northern Powerhouse and Northern Forest combined? If they can pull that off, and execute Brexit successfully to boot, we might be onto something. I can probably summarise this document: ‘We watched ‘Blue Planet 2’. No, seriously, I’m being cynical.They may have watched some episodes of Countryfile too. require lots of CO to thrive? I don’t think we can afford to be complacent here. Another interpretation is that govt is happy that the CCA2008 and the Paris climate treaty are definite, baked-in ‘givens’ that don’t need to be laboured. We can’t afford to let up vocal opposition through reasoned argument until the harms that these ‘status quo’ legal instruments are wreaking on our economy are defeated. Very nice to see Roger here! I think the government knows that Paris is in practice torpedoed if Trump and the Republicans go through with US withdrawal. The bigger problem as I see it is the Climate Change Act. I agree that a much more pessimistic reading is possible. As I tried to express, inadequately, above, the big step for me would be allowing and encouraging fracking in the teeth of inevitable opposition from deep greens. If no attempt is made to reduce CO2 emissions and the price of energy this way, with consequent increase of UK energy security to boot, then we’re in the pocket of the worst forms of green cronyism for the foreseeable future. Effective Brexit is clearly the main priority for the likes of Gove and Boris. Changing the subject away from the NHS has to be a broader Tory aim. From the crooked timber of humanity nothing straight was ever made. As predicted, while the more sensible environmentalists like CPRE and the Woodland Trust welcome it, the climate action brigade aren’t happy. Moonbat says it’s a plan to do nothing, and whines about climate breakdown and fracking. The Grauniad go to Greepeace and Friends of the Earth to find someone to complain about it. The Indy resorts to Caroline Lucas, who talks about “Blue Planet policies” (as Jaime said), also says ‘climate breakdown’, and gives it 5/10. Will it compensate for the EU’s deforestation policy? “A loophole in carbon-accounting rules is spurring a boom in burning wood pellets in European power plants. The result has been a surge in logging, particularly in the U.S. South, and new doubts about whether Europe can meet its commitments under the Paris accord. Therefore the numbers in the spreadsheet don’t need to be changed and we are decarbonising our economy by burning carbon in the form of wood. UK taxpayers subsidise energy firms to burn wood to meet EU renewables targets. But the report from the Department of Energy and Climate Change (DECC) shows sometimes much bigger carbon savings would be achieved by leaving the wood in the forests. Thanks for all that Dennis. I was thinking of mentioning the rethink on crazy, green-in-name-only wood burning regulations in my next post. There is some low-hanging fruit for Gove in areas like this. I doubt he’s completely unaware of that.